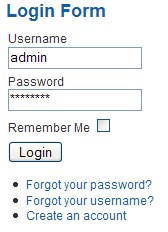 The information shown in the Login Form module can be customised from the Module Edit screen. To learn how to do this see Changing the Login Form module settings. The following list describes the various settings that will change the appearance of the Login Form module. Title: Changes the title shown for the Login Form module if Show Title is set to Show. The default is "Login Form". If Show then the Title will be shown at the top of the Login Form. This is the default. If Hide then the Title will not be shown at the top of the Login Form. Pre-text: This text will be shown above the Login Form but below the Title. It may contain HTML markup. Post-text: This text will be shown below the Login Form. It may contain HTML markup. If Yes then a simple greeting message is shown above the Logout button once the user is logged in. For example, it might say "Hi, Joe Bloggs". This is the default. If No then no greeting message is shown above the Logout button. Name/Username: Determines whether the user's real name or the user's username is shown as part of the simple greeting message. Additionally, the "Create an account" link will only be shown if the Allow User Registration field in Global Configuration is set to Yes. To learn how to change this setting see Changing user registration settings. This page was last modified on 19 October 2018, at 04:19.